The most popular way to finance a large home improvement project is with a home equity loan or line of credit or with an FHA 203(k) loan. 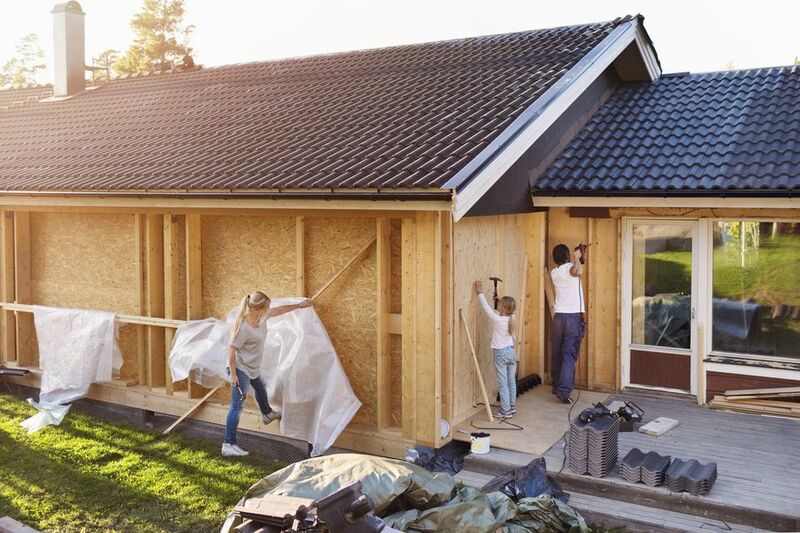 The most popular way to finance smaller projects is with cash: either pulling cash from savings or frog-leaping from one no-interest credit card offer to another. But one secret—and exciting—type of affordable home remodeling loan doesn't come through the Federal Government or private lenders. It comes from that agency normally associated with transit, property taxes, licensing, roads, and courts: your local county government. Best of all, some of these loans come completely interest-free. Names differ from county to county, but they often go under the name of Home Improvement Program ("HIP"), home repair/improvement assistance, or some variation thereof. Under these programs, you take out a loan for home improvement purposes, and counties agree to subsidize your loan. A substantial amount. The amount you save is so much that, if you qualify, it's definitely worth the red-tape involved in applying. In one common scenario, a county might subsidize 3 percent of your loan's interest rate. In another scenario, the loan might even be 0 percent. Let's run the numbers for the first one, the partially subsidized loan. This example of a five-year $50,000 loan compares your costs with and without an interest rate reduction of 3 percent. Without the Subsidy: Imagining an 8 percent interest rate, you will pay about $1013 per month. Total interest is $10,829. With the Subsidy: With the same interest rate reduced by 3 percent, you will pay about $944 per month, for a savings of close to $70 per month. Total interest is $6,614. By taking out the HIP-style loan, you would have saved $4,215 in interest. Counties have a mandate to serve their residents, especially low-income families. On the larger scale, counties are interested in maintaining the value of housing stock. When housing stock declines, overall quality of life declines. Finally, providing these loans drives the economic machine by helping to create projects that create jobs. Begin the process by applying through your county. The county may direct you to a local lender, at which point this may become a regular home equity loan or HELOC subsidized by the county. A typical borrowing cap is around $25,000 to $50,000. It is rare to find HIP loans in the six-figures. Your annual gross income must be below a certain limit. One typical amount (King County, Washington) is $64,400 for a family of four. Your house must be valued below a certain limit. You must let the program administrator monitor the project. All county taxes must be paid in full. You cannot use the money to pay off other loans, even if those loans are house-related. You cannot use the loan money to pay for projects begun before the time that the HIP loan is approved. You must complete the project within a certain time period, such as one year. Typically you are barred from financing luxury projects, such as swimming pools, satellite dishes, hot tubs, decks, etc. Some counties put limits on the types of appliances you can purchase with the loan, allowing only permanent ones (a furnace vs. a refrigerator, for example). Sometimes "luxury" is even stretched to include kitchen remodeling, fences, and garage construction. Also, these loans are for rehabilitating structures, not purchasing a new property or financing construction. Note, though, that some counties do have similar programs for helping homeowners purchase properties. It is not guaranteed that your county will have this program. Some do; most don't. Start with your local county's website. From there, it may be under the social services, housing, or community development departments. If searching within the county, use the words "housing improvement," "HIP," or "repair assistance."